It’s happening virtually every day, right in front of us. It’s a new type of crime: a crime against humanity and a war crime all in one and the Israelis are currently practising to perfection. Although some examples have been reported few have noticed that, like serial killings, it is a crime that is both deliberate and recurrent. To correct that misapprehension I’ll give some examples, see if you can spot the deliberate and calculated crime. On Thursday April 4th 2002 Samil Ibrahim Salman was shot in Bethlehem’s Manger Square. The middle aged Palestinian Christian had risen at dawn and crossed the square every day to ring the bells in Bethlehem’s Church of the Nativity. However on the morning of the 4th Samil was felled by a single bullet. Medics say that Samil bled for hours before an ambulance, blocked by the Israelis, was eventually able to reach him. But by then he was already dead. That same Easter in Bethlehem the mother and brother of Sami Abden were shot after getting caught in cross fire between Israeli troops and Palestinian militants. At least that is what Israeli authorities said about their deaths. Again though neither was killed outright but only bled to death after Israeli troops stopped ambulances trying to reach them. More recently Adla Abdel Jaber As-Sayyefi, 37, went into labour on the morning of December 10th. Her husband phoned for an ambulance, because she was due to have gone to hospital to have an operation for what was to be a breech birth. However the ambulance was unable to reach their village of Tel because of the trenches and military checkpoints. So instead it was suggested the ambulance meet Adla and her family at another checkpoint, where there would be less distance for the pregnant woman to walk – a matter of meters, not kilometers. In a borrowed car Adla, her husband and in laws went to meet the ambulance. However when they came within view of the checkpoint, with the ambulance waiting for them on the other side, a tank blocked their path. Although Adla’s husband beeped the car’s horn and the ambulance turned on its siren for some time the tank remained stationary. Finally Adla’s husband got out of the car and shouted that his wife needed to get to hospital – but there was still no response from the tank. In other words a new type of crime is being committed: one that is deliberate and calculated to cause maximum pain. And its victims are the very young and the old, the sick and the injured: the most innocent and the most vulnerable. Like Munira Ahmed Kabaha, 30, from Tour Al-Gharbia near Jenin. On December 6th 2002 she went into labour; her husband, Muwwafaq, telephoned Al-Razi hospital in Jenin, but was told that the ambulance could not reach their village because of checkpoints. So they arranged to meet at As-Shuhada junction, where his wife could be transferred to the ambulance. All went well, they met with the ambulance and continued to hospital, until Israeli soldiers stopped the vehicle. After some prolonged negotiations between the soldiers and medical personal it was finally allowed to proceed. But only after Munira began giving birth. By the time the ambulance had reached hospital however the baby was dead, doctors say largely because of delays in getting the mother to hospital. In effect we have a new type of crime here, so new that it doesn’t even have a name. But there is undoubtedly a deliberate policy to deny aid to those who need it most: the sick, the injured, the very young and the old. And the people who thought up this crime are clever, diabolically clever, because the perpetrators can hide behind excuses of “medical complications” and “transport problems”. When in fact these deaths are the result of a deliberate, sustained strategy: a policy designed to cause maximum pain and suffering to the most vulnerable and the most innocent, with the ultimate aim in turning Israel’s occuped territories into one, big concentration camp. 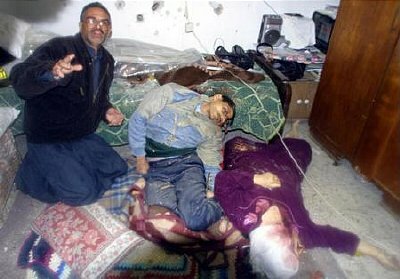 Sources: The Times May 3rd 2002, The Palestinian Monitor 17th December 2002, and thanks to Raja Mattar.